Ford's loving its new Aston-ish corporate grille so much that it's taken delight in slapping it on everything they make. 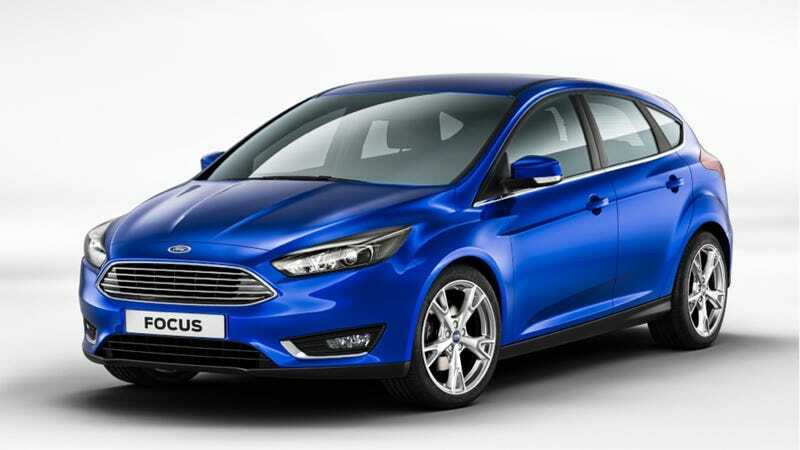 It began with the Fusion, carried over onto the Fiesta and the 2015 Ford Mustang, and now here it is on the facelifted 2015 Ford Focus. Though as corporate grilles go, the trapezoidal one definitely ain't bad. Which is a lot, considering how boring it is when every single car a company makes takes on the same face. These pictures are technically not "official," but they did leak out on Ford's French site, so that's about as official as it gets. There are no official specs yet, but as it's just a facelift, don't expect anything too radical. MyFord Touch should be getting an update, and there might be a 1.0-liter EcoBoost option, and hopefully a plug-in hybrid version as well. Though that last one may just be wishful thinking. From the rear, the car is basically the same, though it's not quite apparent from these shots whether or not the smoked headlights/taillights treatment will extend across the range, or will be limited to top-of-the-line duty. The interior's been fiddled around with a bit as well, with a re-designed center stack and a different steering wheel. Focus interiors definitely have come a long way since the original model, and this one looks like it's well-designed, with big, chunky dials and buttons. Which is always an upgrade from the J-Maysian interiors of days past. The new wheel looks like a big improvement as well, with a thick-rimmed three-spoke replacing the current four-spoker, which was getting a bit shabby. Oh, and there's a station wagon version as well, as is traditional. And because it's a wagon, it looks good. Because of course it does. Now the only question is if they'll be making a Ford Focus ST wagon, and will they be selling it here? I'll take mine in brown. Always in brown. H/t to Peter Leung and Blogautomobile.fr!